I originally began this in February, knitting the 29.5” size, and got a quick start. However, I was really unhappy with how the neckline curled, and the crochet edge I tried to add didn’t really work. Also, my gauge was off and the top was too small. For those reasons, the project went into deep hibernation until I decided to start from scratch. On the neckline, I substituted P1, k1, p1, k2 across for rounds 1 and 3 to stop the curling. It works great! If you are considering something similar, you might instead want to do P1, k2, p1, k1 across–I think it would flow into the cable a bit better. When you separate out the sleeves and cast on stitches to join the front and back, the pattern tells you to cast on the correct number of stitches to maintain k4p1 rib. I think, though, that you’re better off jumping ahead to calculate the number of stitches you’ll need to maintain the k2p2 ribbing needed in the next step. You can work all the newly cast-on stitches in stockinette. It’s just for a few rounds anyway and you won’t have to fiddle again with doing more adjustments to get the correct number of stitches when you make the transition to k2p2 rib. 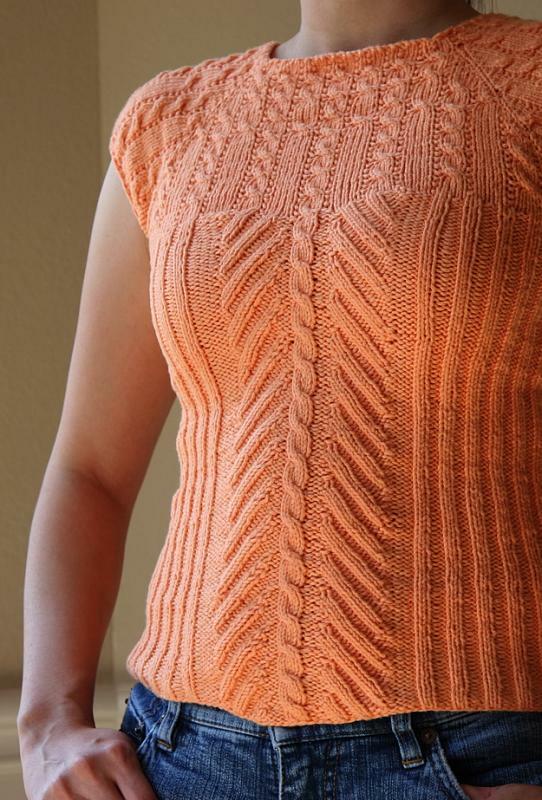 No one will look up your armpit (I don’t think) to notice that you haven’t maintained k4p1 rib, but even if they did, I personally think it looks better to have that section done in stockinette rather than having a few odd purls in there. Try as I might, I could not get the center cable to be...well...centered. The stitches worked before the cable ended up tighter than the ones worked after the cable, even though I tried to consciously loosen/tighten the stitches as I knit. I used a smaller needle size for the waist area for a bit of shaping. I added a good bit of length and was still able to use just 4 balls. The pattern calls for ending on round 8 of the cable pattern, but I think it looks nicer to end on round 4. I did k2tog or ssk for the knit rib portions of the center panel when binding off to prevent too much flaring of this section. I love the fact that instructions for cabling without a needle are incorporated right into the pattern. It’s a great way to learn the technique if you’ve never used it before.